**Note that this is the same manufacturer as the 2018 race. Sizes run big. See sizing chart below. Size exchanges will not be available until after the race. 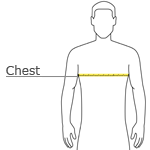 With arms down at sides, measure inches around the upper body, under arms and over the fullest part of the chest.